I admit I have a soft spot for ramen and noodles, so be prepared for oodles of noodles and I promise they won't be hard to swallow. Santouka in the Mitsuwa Market in Venice is no exception. This is the place I go to for ramen on the west side if I don't want to venture out to Gardena's Shinsengumi that is dubbed SSG among the cognoscenti. For second best, it isn't a bad bowl at all. Slurped on a cloudy Saturday afternoon after sleeping in, it's even better. 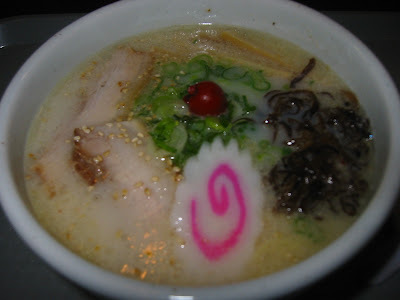 The signature ramen is the salt (shio) ramen, which has an impressively deep pork-based broth but is inferior to SSG's Hakata ramen broth in one critical way -- it's significantly oilier, which distracts from the flavor. The toppings include the usual suspects, such as crunchy green onions, chewy bamboo shoots, tender slabs of pork and a slice of fishcake that harmonize together both in flavor and texture. Santouka's version also comes with wood fungus and a pickled plum that submerges into the broth as you mix the noodles and feels like a pearl in the rough when you scoop it out because of its vibrant red color. I like the element of surprise, both to the eye and the palate, that comes with the pickled plum. It has a tangy taste that complements the thick broth very nicely. The noodles are decently firm but again, I prefer having more control over the doneness of the noodles, etc, like in SSG. And I would like the noodles to be firmer. I have tried the spicy miso ramen and it's pretty good despite not having the pickled plum in it. I would recommend the salt ramen for first-timers. 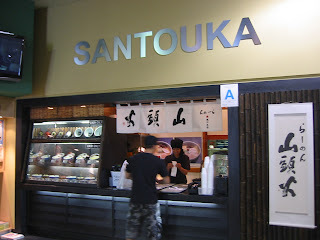 Santouka also offers the standard soy (shoyu) and a variety of combinations with mini rice bowls. Service is fast, parking is convenient, ambiance is barebones but I like that I can catch up on my grocery shopping on the way out (natto, anyone?). Take a jacket. It gets chilly in the food court, and even colder in the market. Santouka also has outposts in the Mitsuwas in Torrance and Costa Mesa. This one is located on the corner of Centinela and Venice. There is absolutely no reason to go to Sawtelle for your ramen cravings anymore. And yes, it's better than Daikokuya in Little Tokyo, or any ramen joint in LT, for that matter. 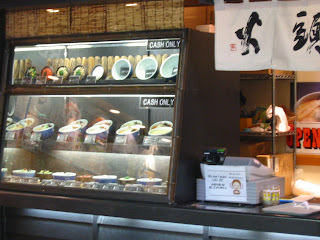 Daikokuya is plan C, when I have a hankering for ramen during the week. Avoid San Sui Tei, the new place that replaced Kobe Ramen a few doors down from Daikokuya, at all costs. The tonkotsu ramen was downright awful and service was infuriatingly slow. We'll have to continue standing in line for Daikokuya for now. what do you do with the natto? first off, buy the ones that come with a mustard and soy sauce mix (make sure they're MSG-free. most of them aren't), get some very fresh organic eggs you could eat raw, make some rice, cut some kim, make miso soup, crack the egg and beat it in a small bowl, mix in the natto with 2 sauces in the bowl, then pour the egg and natto mixture into the rice and mix. then enjoy the natto rice bowl solo or wrapped it in crunchy kim. I used to not eat it but I am now a convert. and it's so healthy. somebody's in a home improvement mode. actually, i've been to momofuku noodle bar and found it highly uneventful. the broth of their signature pork-based ramen was very oily without depth and the only good thing about it was the chashu, pork slices. in short, it has nothing on SSG.